Yaki udon is a teppanyaki dish that ranks alongside yakisoba as one of Japan’s best cheap eats. As a perfect accompaniment to alcohol, it remains a perennial favorite on the menus of Japan’s izakaya informal dining establishments. 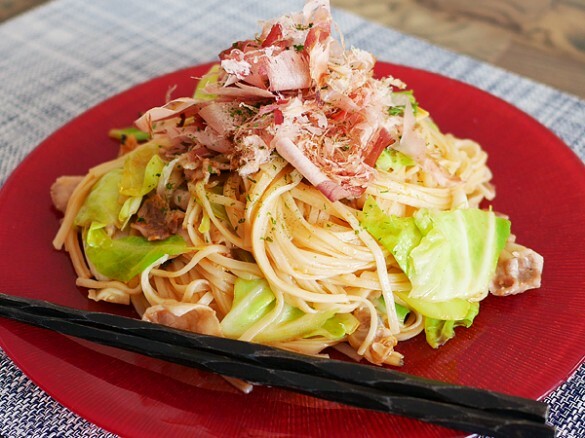 However, it’s surprisingly hard to get right and many people struggle because it’s not as easy to make as yakisoba, even though they’re both fried noodle dishes. This week, I’d like to teach you my three tips for making tasty yaki udon for grown-ups, which will go nicely with your evening drink. (1) Use dried rather than fresh udon noodles. 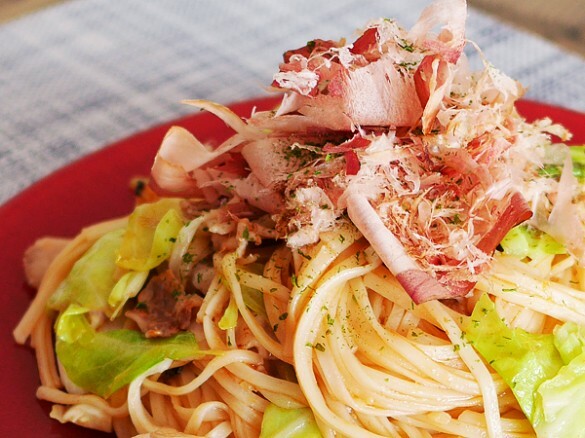 Dried noodles are best for ensuring that the udon will stay plump and springy even when cold, rather than becoming stodgy. (2) Enhance the umami with shellfish stock. You can take the umami level up several notches by blending bonito stock (principal component: inosinic acid) with shellfish stock (principal component: succinic acid). This creates a rich, deep flavor that’s the ideal accompaniment to beer or other alcoholic drinks. (3) Sauté the noodles in mayonnaise instead of oil. This adds the uniquely velvety texture of mayonnaise to the dish, giving it an even richer flavor. Half-calorie mayonnaise not only stands up well to heating, but reduces the overall calorie count, too. 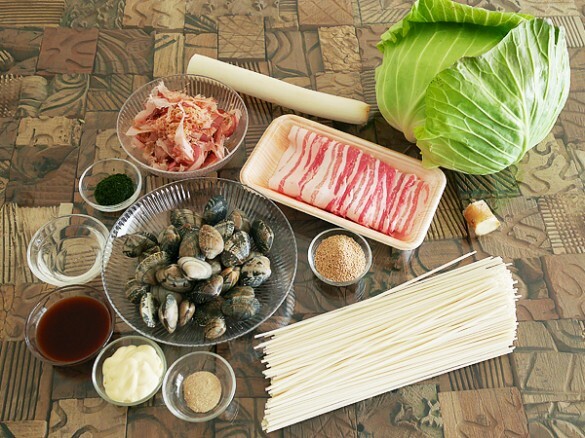 ・Udon noodles (dried)…200g ・Cabbage…2-3 leaves ・Leek…Half ・Ginger…About 6cm ・Pork belly (sliced)…100-150g ・Manila clams…200-300g ・Bonito stock granules…2 tablespoons ・Saké…2 tablespoons ・Japanese Worcestershire-style sauce…3 tablespoon ・Mayonnaise…1 tablespoon ・White pepper…As needed ・Dried bonito flakes…As needed ・Aonori (powdered green seaweed)…As needed *Use quick and easy stock granules for your bonito stock. It’s fine to leave it out if you can’t get any, though. 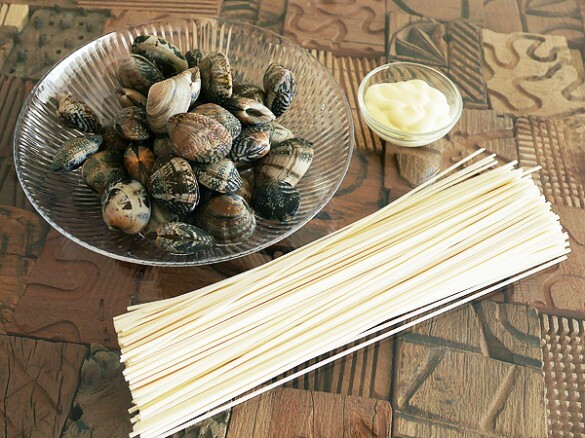 You can also use ready-shelled clam meat to make the Manila clam stock. 1. Cut up the ingredients. 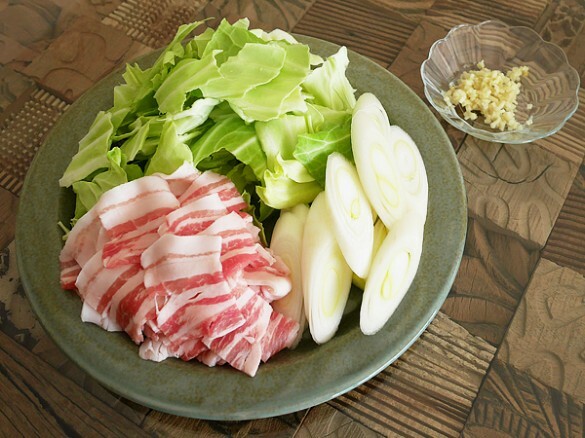 Tear the cabbage leaves into bite-sized pieces, cut the leek diagonally into thin slices, cut the pork belly into 3cm-long strips, and finely chop the ginger. 2. 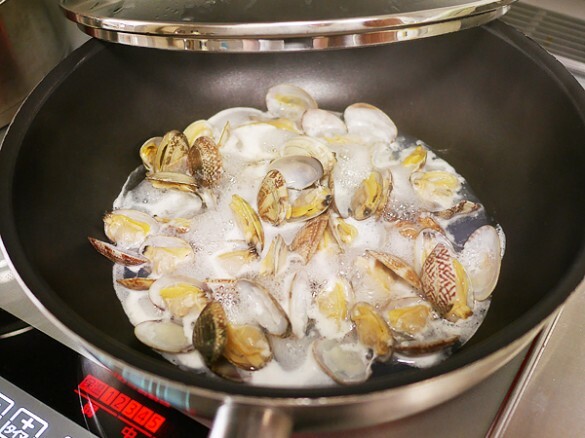 Having rinsed the Manila clams to remove any salt, place them into a frying pan with the saké, then put the lid on the pan and steam them until the shells open. Remove the meat from the shells and separate it from the stock. 3. Bring around 2 litres of water to the boil, then put in the bonito stock granules and boil the udon in the stock. Follow the boiling time displayed on the package. 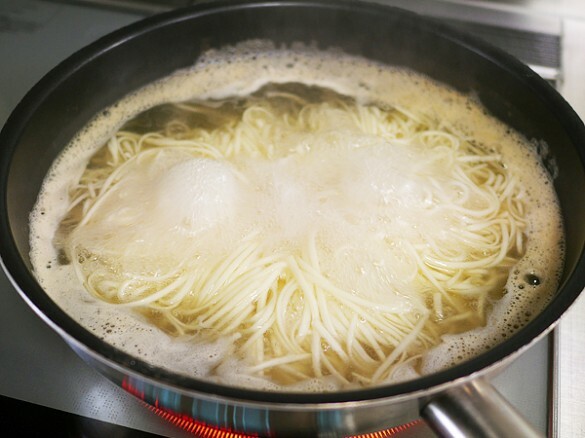 Once boiled, transfer the udon to a strainer and lightly run cold water over them. 4. 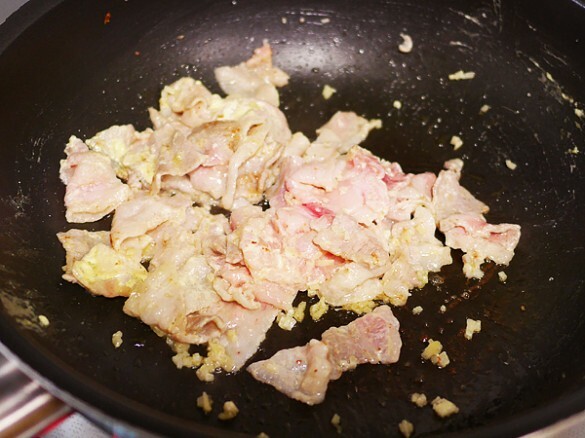 Clean the frying pan, then put the mayonnaise, pork, and ginger into it and place on the heat. Sauté carefully to start with, to ensure that the ingredients do not burn; once the fat from the pork emerges, turn up the heat and grill until aromatic. 5. 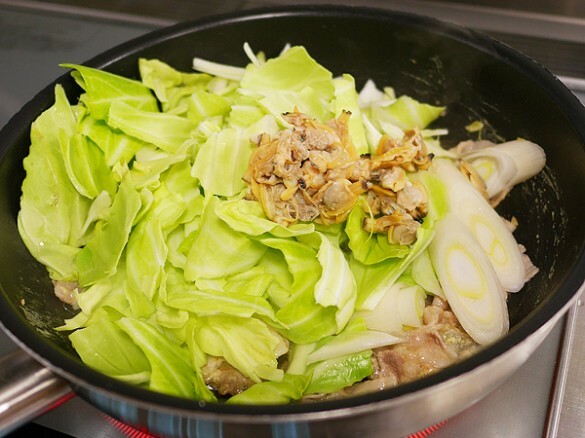 Add the cabbage, leek, and Manila clam meat and continue sautéing. 6. 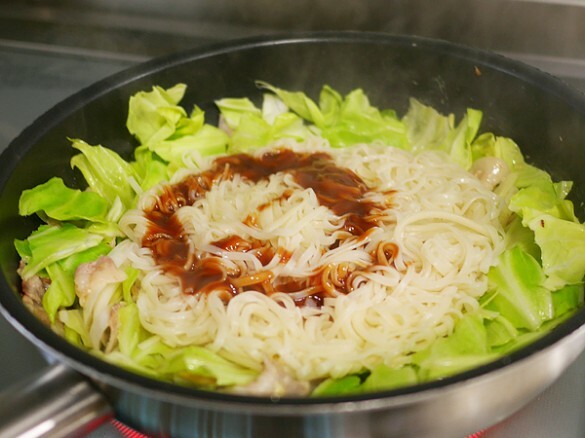 Once the cabbage has softened a little, add the udon, the Manila clam stock, the sauce, and the white pepper and briefly sauté over a high heat. 7. Transfer to a plate and top with dried bonito flakes and aonori before serving. By SUGI AKATSUKI see all recipes Profile:SUGI AKATSUKI Graduate of the University of Tokyo. Researches culinary culture and foods that promote longevity and beauty. Studied basic medical science and life science at university. After studying organic food and Kushi macrobiotics, she began to conduct culinary research independently. Her motto is “simple ways to stay beautiful.” Her specialty is healthy dishes ideal for the busy woman of today. She also teaches yoga and has a popular blog（http://saqai.com/）.